BMW 5 series 520d Prestige is one of the variants in this model series. The company has given this vehicle an expensive taste in terms of outer looks, inner grandeur and the overall ride convenience. Starting with the inside, there are numerous luxurious design elements like plush seat upholstery to the exotic wood trims. The seats come with lumbar support, headrests, armrests and a variety of other vital functioning aids for the surest comfort of the occupants. A tall highlight of the cabin is the iDrive system which comes along with a 16.5cm color display, a CD drive, and a controller with direct menu control buttons. The outside of the vehicle has been done up for the most undiminished glamor. The light weight multi spoke alloy wheels give the vehicle a more pronounced appearance. The signature front grille and the clean body lines impart a more distinguished character to its looks. Coming to the raw side of the vehicle, it is powered by a BMW TwinTurbo engine, which comes along with brake energy regeneration. Armed with this power-plant, the car can bolt from 0 to 100kmph in just 7.7 seconds. Aside from just performance, the engine also makes for a cleaner fuel yield, with a class leading mileage of 18.12kmpl. At the front, the car is adorned with the BMW kidney grille, and flanking this are sleek headlights. The company has equipped them with Bi-Xenon lighting systems and four LED DRL light rings. The wide hood underscores the masculine appeal of the front, while the fluidic curvatures add a graceful, feminine touch to it. By the side, the delicate fenders add emphasis to the car's vibrant design, along with the multi spoke alloy wheels. The neatly designed door handles integrate into the overall picture well, together with the side mirrors. The window frames have been treated with a glossy black color, cutting a more outstanding image for the vehicle. The clean body lines that sweep through the sides also invigorate the vehicle's trendy persona. The rear lights have been cleverly designed, and they host all necessary lighting units for surest visibility when driving. The cabin has been adequately modeled, ensuring a pleasant atmosphere through the drive. The seats, the door sides, the front panel and the center console have been arranged for an image of grace and delicacy. The wide seats are ergonomically designed, and they come along with lumbar support for the front occupants. The company has dressed the seats with a premium upholstery combination of Black and Veneto Beige leatherette. A fine wood of Ash Gran Brown further lavishes the space, and it has a chrome pearl grey finish for a more exotic effect. The vehicle is packed with a 1995cc engine, which consists of 4 cylinders with 4 valves per cylinder. The power-plant delivers a power of 190bhp at 4000rpm, together with a torque of 400Nm at 1750rpm to 2500rpm. The company has mated its machine with an 8 speed sports automatic transmission that presides over smoother shifting and better performance. The company has rigged all of the wheels with strong discs, which keep the vehicle on a good hold when cornering and braking. In addition to this, it has a reliable chassis arrangement, consisting of aluminum front and rear subframes. A double wishbone model for the front axle, and a lightweight multi link integral rear axle together augment drive stability. Twin tube gas pressure shock absorbers have also been mounted onto the suspension, giving the most strain free ride possible. Beside all of this, the vehicle has been programmed with a variety of techno aids. The anti lock braking system prevents locking of wheels when turning. The brake assist function further strengthens the braking performance of the vehicle. An ambient lighting system is present along with selectable mood lights. An armrest is present at the front, along with a storage compartment. A center armrest is also present at the rear, and it comes along with a storage facility and cup holders. The automatic air conditioning system is accompanied with extended contents and rear air vents for the best circulation possible. An electric steering column adjustment facility boosts comfort as well as safety. Meanwhile, floor mats in velor add a more expensive touch to the cabin. The interior mirror comes with an anti dazzle function, imparting a blend of safety and comfort. An advanced airbag package sheilds the occupants, consisting of front airbags along with head and side airbags. This vehicle is programmed with an intelligent maintenance system, which eliminates chances of mishaps. The cornering brake control program elevates safety when driving, along with the dynamic stability control and the dynamic traction control programs. Also present is an electric parking brake which comes with an auto hold function. The safety of the vehicle is reinforced with an immobilizer and a crash sensor. 2. Strong techno aids for control and safety. 1. Compared to other models of this brand, it lacks comfort facilities. 2. The cabin's space could be improved. 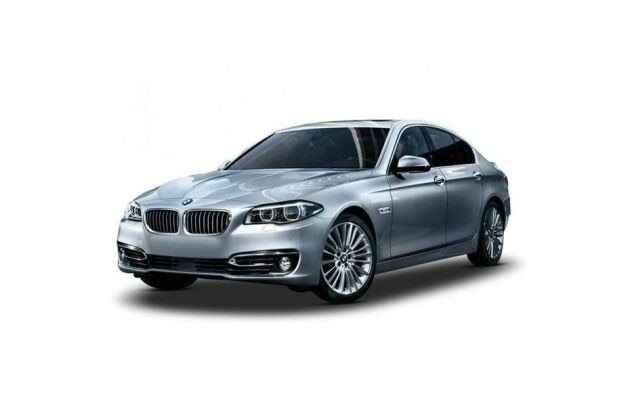 BMW 5 Series 2013-2017 is available in 4 different colours - Imperial Blue Brillant Effect, Callisto Grey, Sophisto Grey Brilliant Effect, Glacier Silver.